If you have any interest in the War of the Rebellion and haven't already read "Co Aytch," then you owe it to yourself to go out and get it now (see bottom of this article for a link to the free, ebook version online). Crane's "Red Badge of Courage," Ambrose Bierce's "An Occurrence at Owl Creek Bridge," or "Chickamauga" are all stirring accounts of combat from the eyes of an infantryman in the War Between the States. 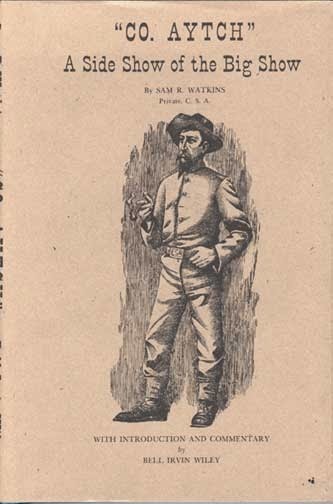 But if you really want to know what it was like to be a foot soldier in the Civil War, read "Co Aytch" by Sam R. Watkins. 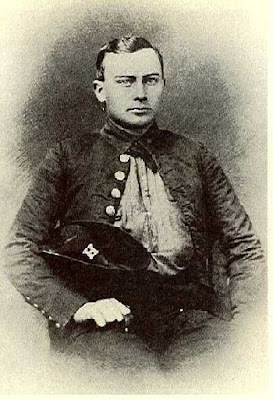 Watkins was a member of the First Tennessee Regiment or "Maury Grays" which numbered 120 members at the time he enlisted when he was twenty-one years old. Twenty years later, he wrote "Co Aytch,"to tell of the fellows who did the shooting and killing, the fortifying and ditching, the sweeping of the streets, the drilling, the standing guard, picket and videt, and who drew (or were to draw) eleven dollars per month and rations, and also drew the ramrod and tore the cartridge." Watkin's memoirs are absolutely riveting. He fought in battles at Shiloh, Perryville, Chickamauga, Resaca, Kennesaw Mountain, Atlanta, Nashville and many other locales. He actually saw Jackson and Lee in the midst of battle. At the end of the war only seven of the original 120 members of Company H had survived and only 65 out of 1,200 of the entire First Tennessee Regiment remained. I have heard men say that if they ever killed a Yankee during the war they were not aware of it. I am satisfied that on this memorable day, every man in our regiment killed from one score to four score, yea, five score men. I mean from twenty to one hundred each. All that was necessary was to load and shoot. In fact, I will ever think that the reason they did not capture our works was the impossibility of their living men passing over the bodies of their dead. The ground was piled up with one solid mass of dead and wounded Yankees. I learned afterwards from the burying squad that in some places they were piled up like cord wood, twelve deep. One of my personal takeaways from reading Co Aytch was that General Braxton Bragg was even more of a liability for the Confederacy than I'd previously thought. When serving under him, troop morale was brought to an all-time low by constant hangings, brandings, and even execution of deserters. Almost every day we would hear a discharge of musketry, and knew that some poor, trembling wretch had bid farewell to mortal things here below. It seemed to be but a question of time with all of us as to when we too would be shot. We were afraid to chirp. So far now as patriotism was concerned, we had forgotten all about that, and did not now so much love our country as we feared Bragg. Men were being led to the death stake every day. There are so many things in this account that history books fail to mention and the passage of time has obscured. If you're like me and want to know "what it was like," this truly is a must read account. You can download a free, ebook version of Co Aytch. here. Going by my blog, you might conclude that I hadn't been relic hunting at all for the past several months. That's actually not the case, I've just been dedicating my (very!) limited free time to researching and detecting instead of blogging. Hopefully, I can catch up and reduce the backlog of planned articles. January has actually been a productive month, especially for Confederate buttons. Last weekend, I had the pleasure of finding three CS buttons in one day. The first of these buttons was found in the middle of quite a bit of "trash" signals. I call them that because I'm only interested in Civil War material and a lot of the other bits of brass, iron, silver, and (shudder) aluminum were unrelated to the War. In any case, I found what appeared to be a brass or bronze coin bent in half amidst other targets representing over 200 years of history. I put the object in my plastic finds box and kept detecting. It wasn't until I got home that evening and began cleaning things that I realized what I'd found was a North Carolina Sunburst button. My efforts to straighten the button weren't very successful but at least it's recognizable for what it is —part of the uniform of a North Carolinian who fought the Northern invaders right up until the very end of the war. That same day, I found another NC Sunburst in a spot I'd hunted several times before. The odd thing about it was that the signal was so blatantly obvious. I wondered how I had missed it while detecting in that area before. In my defense, the grass in this area grows and is cut back throughout the season and sometimes it's thicker in one place than another and the areas of thickness vary from one month to the next. 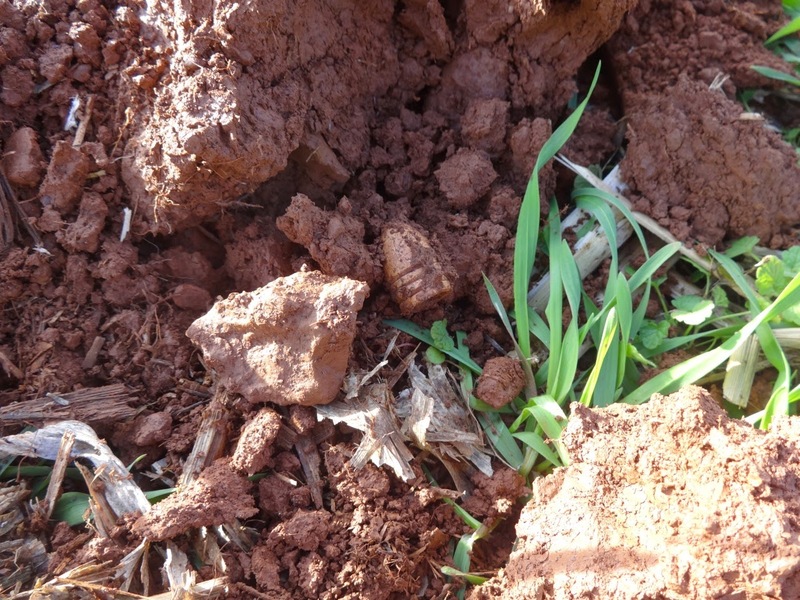 So it's possible it was nestled under a tall clump of grass during my previous visits to the site. Another possible explanation could be that the pervasive EMI from a nearby electrical fence simply masked the target before. Whatever the case, my takeaway was that it never hurts to to hunt known productive spots even after they may appear to be hunted out. Due to vicissitudes of weather, external factors such as EMI, your level of concentration, or simply poor coil discipline, it's quite possible to miss targets even when you think you're being diligent. The third CS button I found was another one that I completely misidentified in the field. 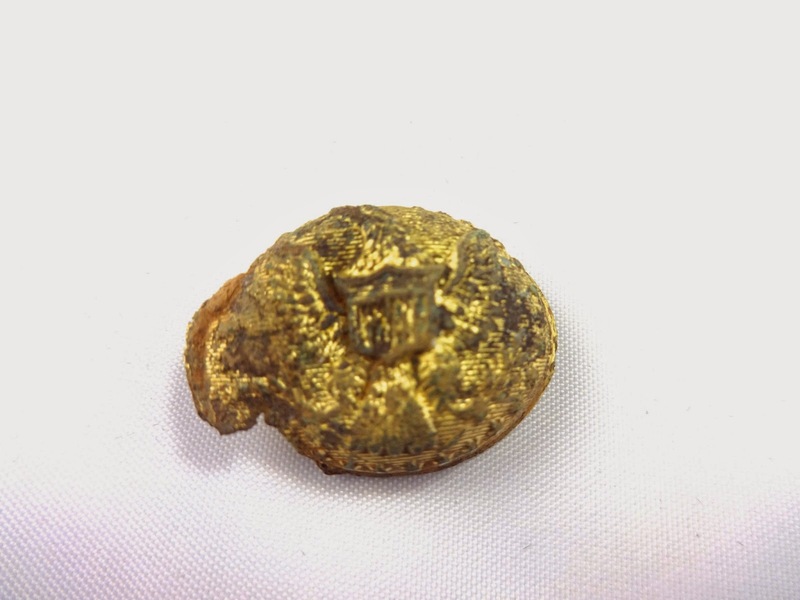 Finding a deeply buried, small, corroded brass button, I put it in my finds box thinking it was probably a general service or infantry Eagle cuff button. I'd found several of the latter in the vicinity so I had some basis for that conclusion. In any case, at home I proceeded to gently brush the face of the button with a toothbrush and was dumbfounded to see a large letter "I" appear with nothing else. This was truly unexpected. 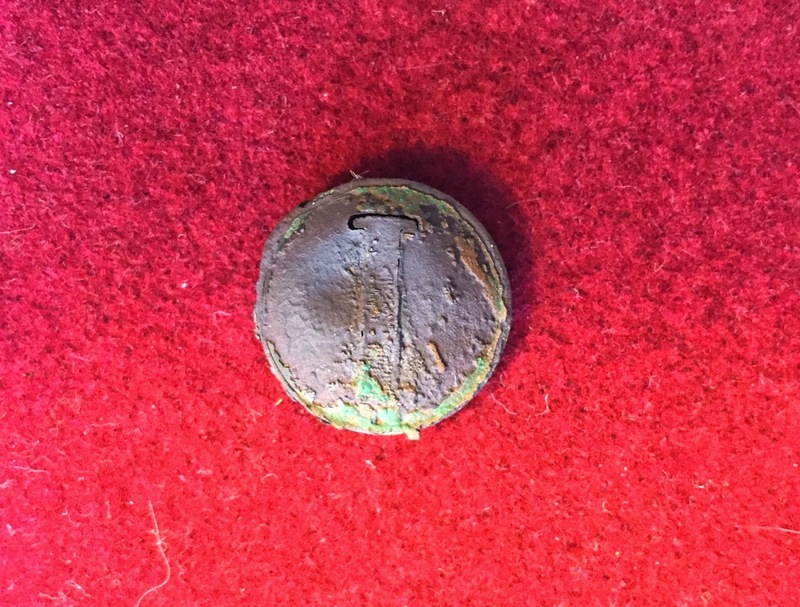 It turned out to be a 19" diameter Confederate Lined "I" button, most likely from a vest but possibly also from a kepi. The button itself is a tad toasty from ground action (probably compounded by lime and fertilizer), but this brings my total CS buttons from this site to 14. 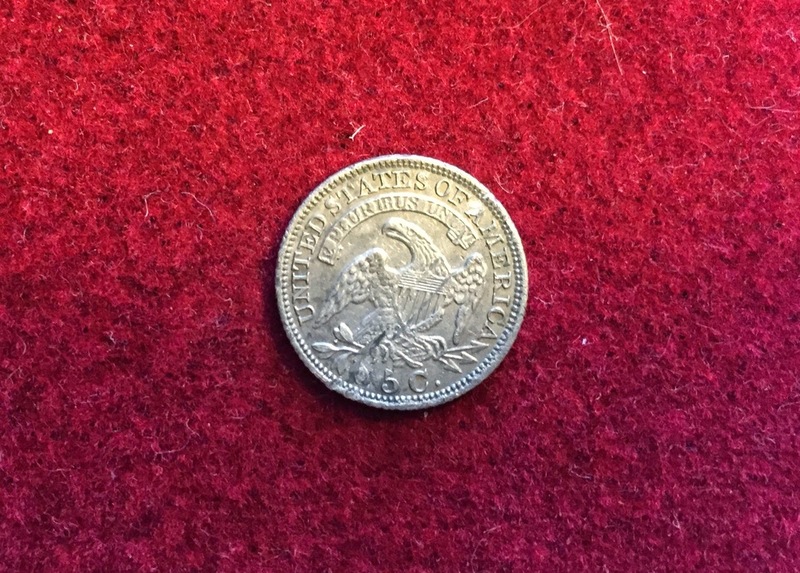 19mm Diameter, Confederate Lined "I" vest button. 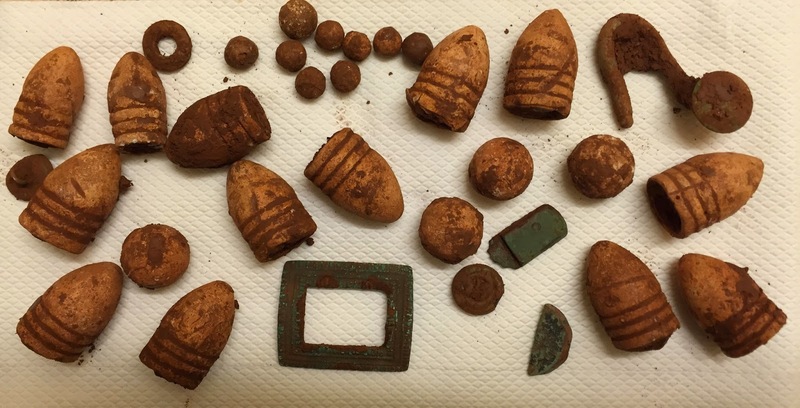 Other notable finds are two Spencer cartridge casings and (my favorite) a Richmond Labs Sharps bullet. 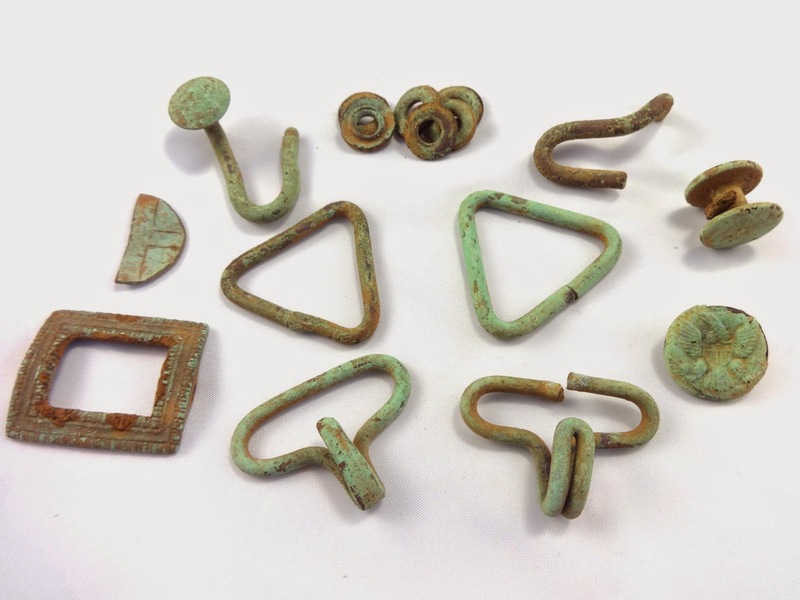 Most of these relics wouldn't have been found by the majority of detectorists out there. I'm not saying that boastfully because I had missed many of these targets myself on previous visits to the site. But unless someone knew this camp existed, and was determined to find additional relics and slowed way down to hear them, they would never apply themselves to the extent needed to discern targets. I find that very encouraging as it's increasingly difficult to locate sites that haven't been repeatedly hunted over the past 50 or so years. 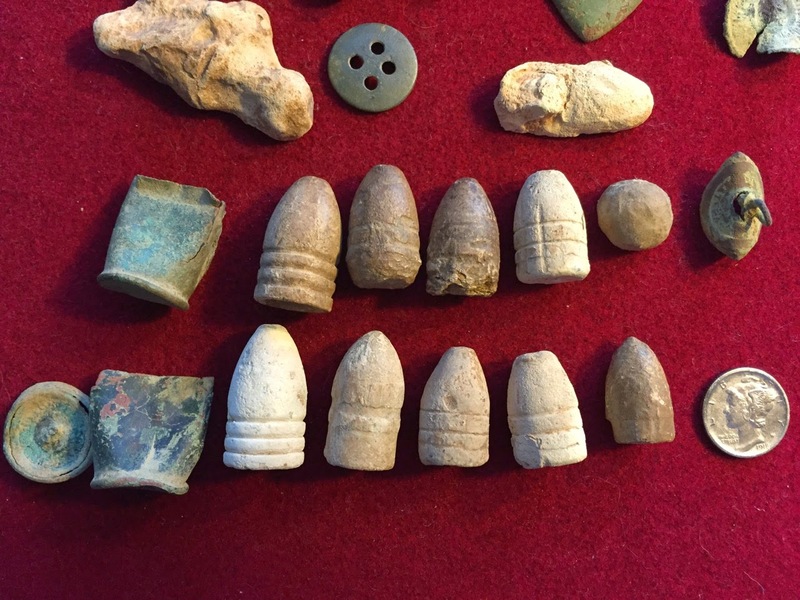 The other good news about these relics is that they came from two distinct locations. So that means I've been fortunate enough to locate another CS camp. I'm hoping that continued efforts will pay off in the form of additional historically significant relics coming to light. 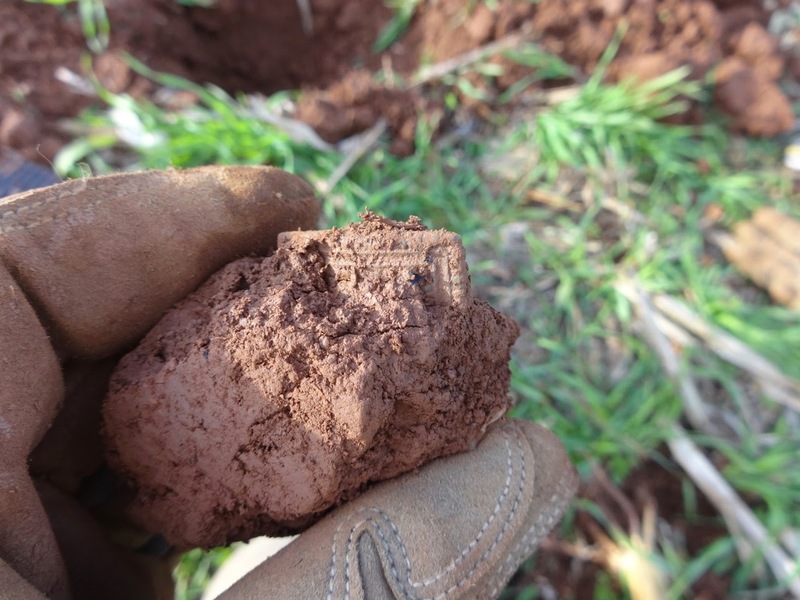 I metal detect for one reason —to locate relics of the Civil War that confirm my research. For that reason, whenever I find something of merely numismatic value, I pretty much don't care. For sure, there are lots of detectorists out there who specialize in coins—they can tell you anything about them—and who covet them above all else. I'd rather find a bullet any day. Any day, that is, unless the coin is part of a Civil War site and was dropped by a soldier. Then and only then does it become valuable to me. Now let me add that I've never found a gold coin so this declaration probably hasn't been put to the ultimate test. In any case, all this preamble is my way of of apologizing for what I'm about to do which is post a coin find. So, without further ado, here it is. 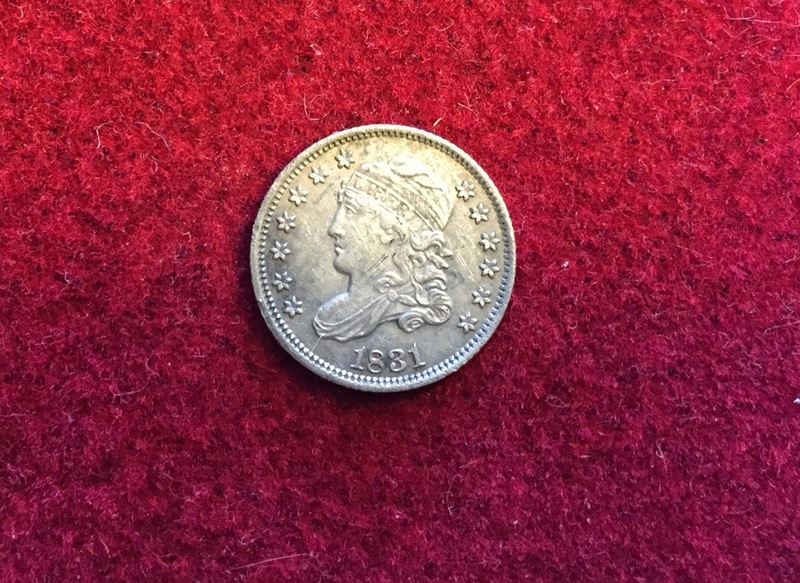 This half dime is amazingly immaculate given its age. Even for me, a non-coin guy, the crispness is pretty impressive. All I did was brush it lightly with a damp toothbrush. This coin, together with a few 3 Ringers and Type III Williams bullets, were found while searching for a large camp. These came from an associated picket post. All of the above finds were made in fields that have been farmed for hundreds of years and which continue to be farmed or serve as pasture. My finds from yesterday came out of what used to be farmland but is now deep, tangled, briar-infested woods. I invited my friend Lanny to come along and shared the research with him that justified our visiting this particular location. I'll confess I also did it so he didn't think I'd completely lost my mind as we hiked back into the wilderness. We weren't able to get to the center of the area of interest as I'd noted it on my handheld Garmin GPS. But we made our way around the perimeter in an attempt to find a spot where we could actually swing our detectors. Taking advantage of a hunter trail, we enjoyed a brief respite from briars. And while we walked, I casually swung my coil over the path waiting for the inevitable shotgun shell to appear. And suddenly, I did get a signal but it read in the 70's on my T2 —that's brass and lead territory. I remarked to Lanny almost apologetically, "Well, I have to dig it ..." and out popped a piece of camp lead. Four feet away, I got another piece. This didn't seem like much to Lanny and his facial expression indicated good natured skepticism. But for me, after staring at this map for months, it was confirmatory evidence that I was "there." "There," of course, is where "They" were. "They" being the soldiers who fought in the Civil War in North Carolina. I pursue their ghosts wherever I can find them and finding evidence of their existence and presence is one of my greatest pleasures. So, while Lanny was being an incredibly polite and tolerant friend, I was trying desperately now to penetrate the briars and get to a place to hunt. I will gloss over the details of this but let me just say that the briars in that particular neck of the woods ate well that day. Finally, I got to a place where briars were few and far between and the original topography could be discerned. I turned on the T2 and started detecting at the bottom of a slope about 400 yards from where I'd found the camp lead. Within 10 minutes of starting to search, I got a good signal at the base of a tree. 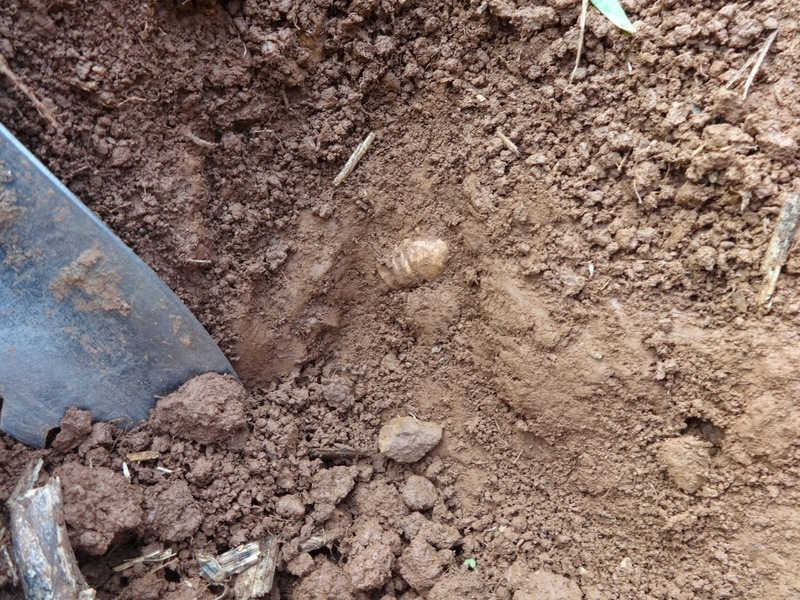 Digging was difficult in the wet soil and with the abundance of roots but in short order, I was holding a .58 caliber "3 ringer." I called Lanny to let him know the good news and learned that Lanny had momentarily lost his prescription lenses in the dense woods. Thankfully, he'd found them and started making his way to my position. I started detecting again, and 3 feet from the bullet I'd just found I got another good signal. Yep, another bullet. Then another, and another. 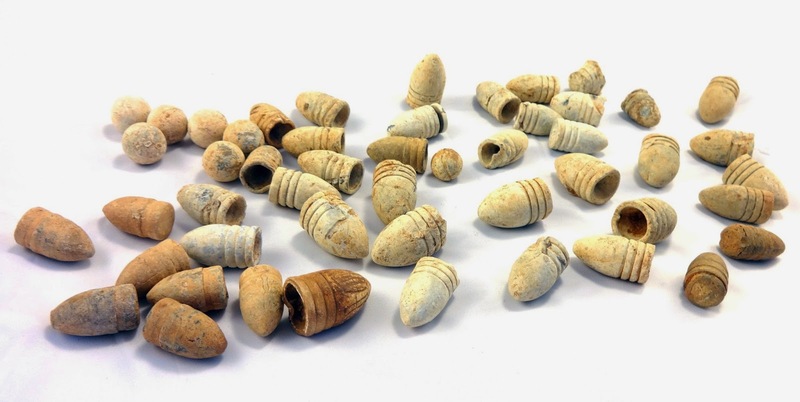 They were densely packed in this spot—both standard .58 miniés and Type III Williams Bullets. Evidence of the US soldiers who had camped here in April, 1865 and who I had tracked down to this very spot. It occurred to me that I hadn't heard from Lanny for a while so I phoned him. He answered, and in between muttered curses he told me he was making his way through the dense undergrowth to where I was. Eventually, he emerged, looking like someone who had survived a truly harrowing experience. He pointed to his prescription lenses and said, "Find of the day!" But five minutes later, after I'd shown him where I was finding the bullets and as he prepared to do some detecting, he looked stunned and said, "Oh man, where's my shovel?" Sure enough, in his mortal combat with the briars, vines, and pines he'd somehow let go of it. Now this was no ordinary shovel but a Predator Tools Piranha, a fine $100 digging instrument, the Cadillac of shovels. Now it was literally a needle in a haystack. We looked back at the mass of briars Lanny had emerged from and realized we would have to go back in there to find that shovel. Well, long story short Lanny despaired of seeing his blue-handled friend ever again. We retraced what we thought were his steps but didn't see anything but mud and hostile limbs and vines. We both stopped to assess the situation, Lanny about 8 feet away from me. He was just about to say something I probably couldn't put on my blog when I said, "LANNY!" and pointed. Three feet away from both of us was his shovel standing upright in the ground where he'd planted it, probably to take my phone call. "Second best find of the day!" Lanny said with a grin. This hunt was truly special because it confirmed my research methodology to myself and my sanity to a friend. We marched into the woods, guided only by coordinates I'd put into my GPS months ago, and came out with relics of the Civil War. And a shovel. 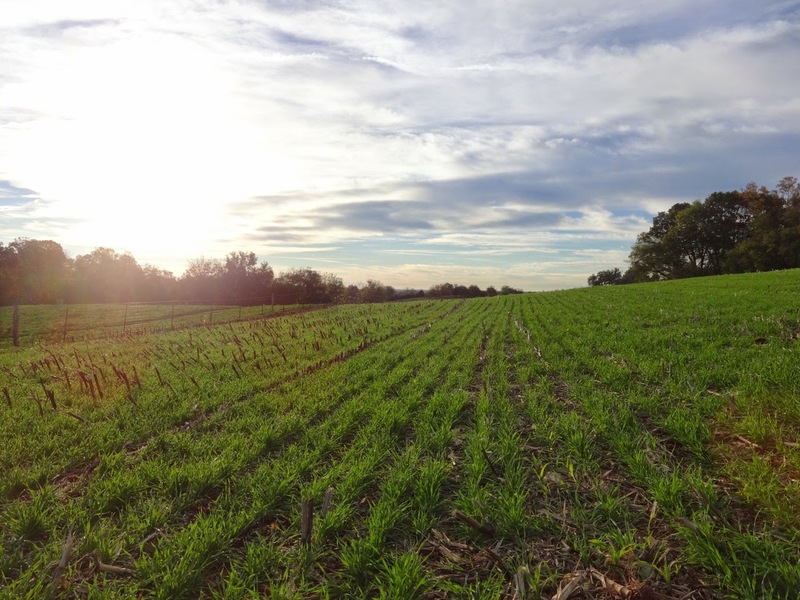 If you drive past the Beauregard Farm in Brandy Station Virginia, there's nothing to indicate the incredible events that its gently rolling fields have witnessed. I've touched on that history before and won't cover it again in this post but suffice to say, there's more to Beauregard than meets the eye—its hidden history makes it uniquely important. Beauregard is my favorite site of any of the DIVs I've been fortunate enough to attend since my first DIV at Coles Hill in 2010. That's due in part to the sheer extent of the property. You can sit down, take a sip of water from your canteen, and gaze out over a vast landscape that, in its essentials, is little changed from 1863. Sure, the Flat Run has been dammed up, some roads are paved and there are more trees now than then, but the key topographic features absolutely (for me at least) have that unique Brandy Station feel that is also evinced from period photos. And some period structures remain, too. 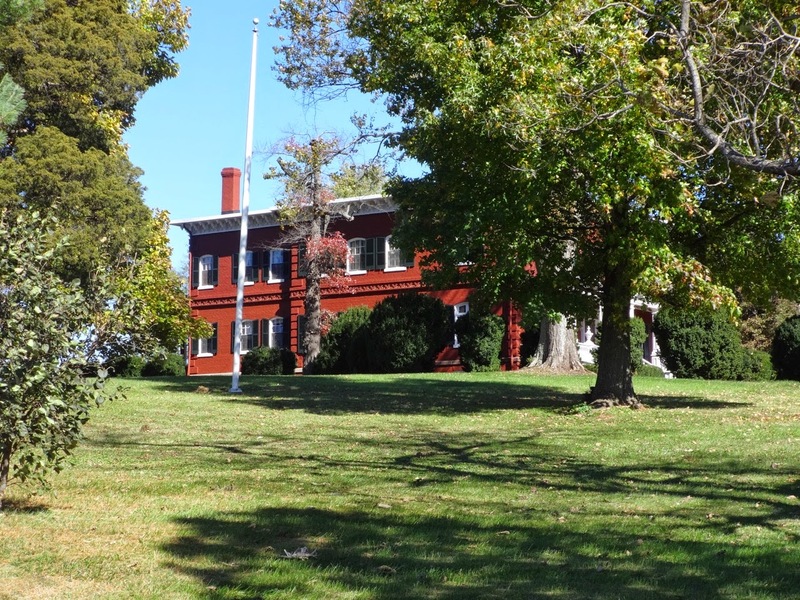 The Barbour house, from which Lee observed the Battle of Brandy Station, stands today amidst ancient oaks that themselves witnessed innumerable scenes of struggle. It's a moving experience to recover a relic within sight of that home knowing that the soldier who dropped it also looked upon the very same building. So it was with great anticipation and excitement that I set out for DIV XXVIII. It was at my favorite site, the weather promised to be exceptional, and I felt a keen sense of gratitude toward the organizers, John and Rose Kendrick, for honoring me with an invitation. Knowing the site from having been there twice before, I derived a hunt plan. I marked on a map where I would start and where I would go next if the first choice wasn't producing. I spent hours on this until I had what I felt was a completely rational plan which I printed out and packed with all of my other gear. This year, I had the pleasure once again of riding to Virginia with old friends Dwight and Keith. It's always an enjoyable experience as we devote the 4 or so hours to talking about our favorite topics: The Civil War, metal detecting, and relics. But this time it was made even more enjoyable by a visit to the White Oak Civil War museum in Falmouth. This museum deserves a future post and if you are a relic hunter, you owe it to yourself to visit in person. At the pre-hunt meeting, there came the moment of truth anticipated by all who have attended a previous DIV -- The Distribution of the Map. This is a printed document showing the hunt boundaries and territories open for hunting. There are always rumors prior to every DIV. 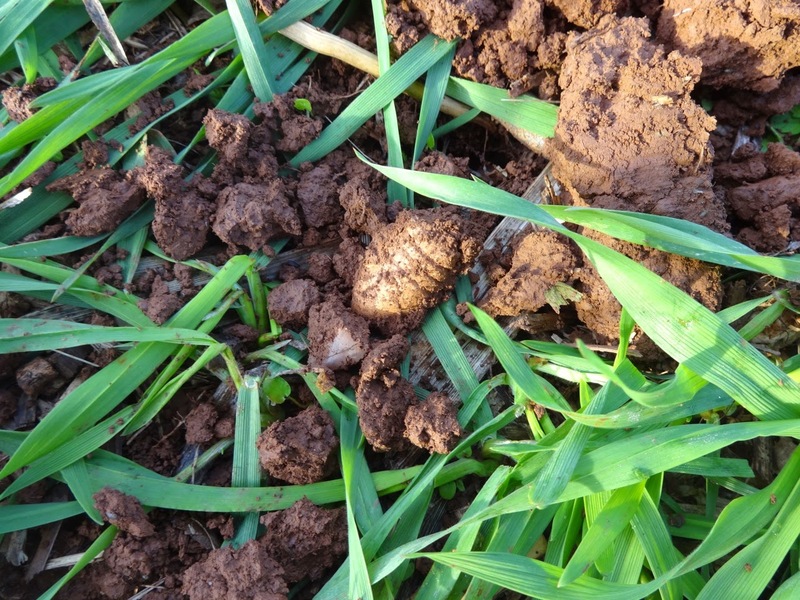 Maybe that bean field that wasn't open for hunting the last time will be huntable this time. Remember that spot with the tall grass where those South Carolina buttons were found? I hear that's been mowed, etc., etc. There are typically audible gasps and sounds of stifled delight from the largely camou-clad crowd as they absorb every particular detail of The Map. This time there was news from John. 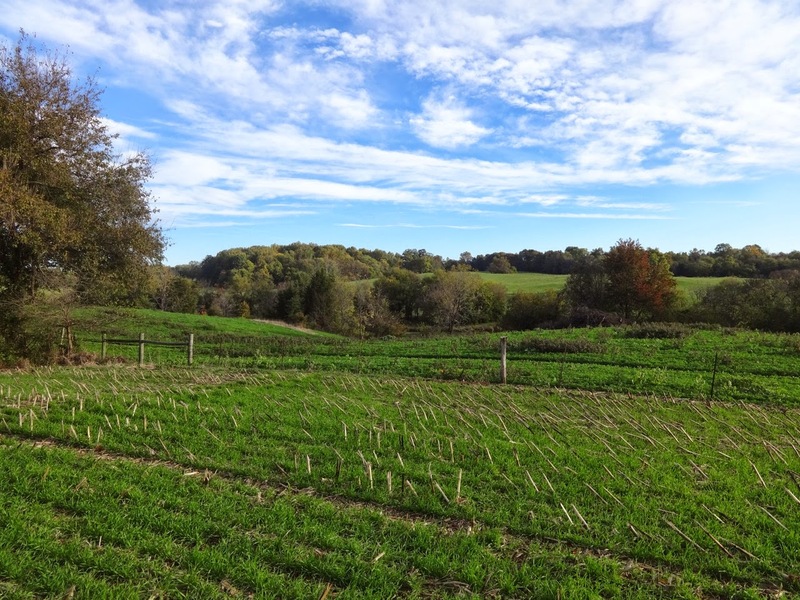 Another site was open to hunt in addition to the previous Beauregard acreage.. It was quite a drive from the main site but by most accounts its mysteries had never been plumbed by a pulse induction machine. This was serious indeed. The possibilities posed by a new site kicked off a process of consideration in my own head that lasted the rest of the evening. It went something like this: At the first Spillman DIV, a heretofore undiscovered i.e., un-hunted cavalry camp was found. A ludicrous number of plates was recovered. I heard (I wasn't there, alas but had to be present for the birth of my son. Yes, it was a difficult choice.) that seven plates were found lined up under an oak tree. The relics in both quality and quantity were the type of thing you see in a Howard Crouch book. They were that good -- I mean we're talking big pieces of Civil War brass. So, the precedent was there, tantalizingly clear. 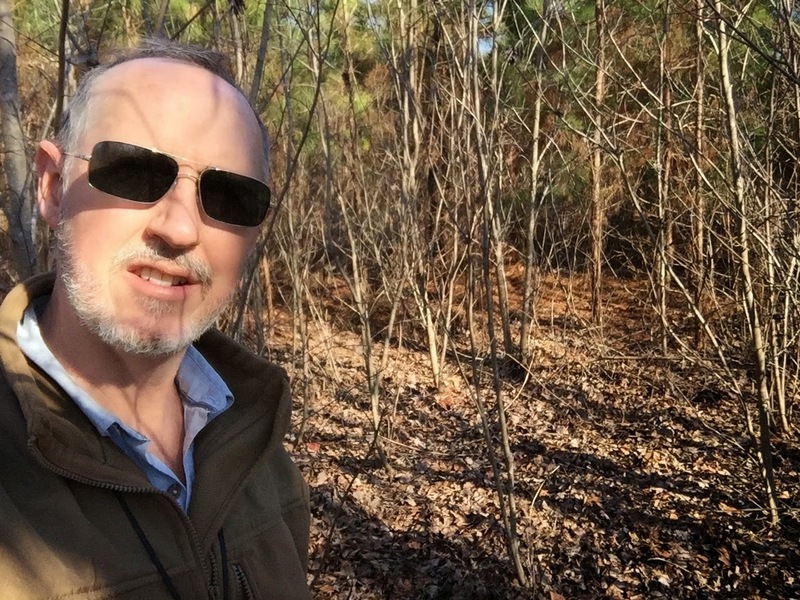 The opportunity to hunt a new site might provide a Spillman-esque experience. How could one rationally pass that up? By the time I woke up, I decided that I would go to the "new site" and start the hunt there instead of in the field around Beauregard. My exquisitely architected plan was out the window but, I told myself, it was out the window for a perfectly rational reason. And then, after breakfast, after driving to Beauregard, and after John's morning talk, I had a change of heart. Literally as we were walking back to the truck, I decided I would stay and hunt near the Barbour house at the spot I'd designated on my original plan as point "A." The other guys looked at me like I was crazy (I'm accustomed to this by now) and I hurriedly got my pack, detector, and my shovel out of the truck so they could speed off to the new site and I could hoof it to point "A." Here's what ultimately swayed me. I work in a super competitive, high stress, ridiculously fast-paced (one of the corporate buzzwords is "speed-of-light") job. I came to Beauregard to commune with the past, not compete with other relic hunters. 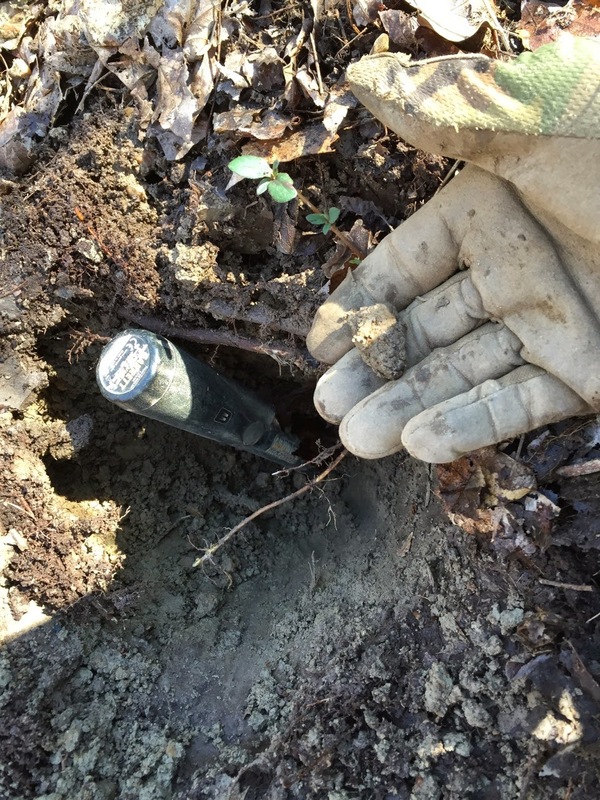 I wanted the savor the experience of finding relics of the Civil War. I craved silence and the sounds of Virginia, not EMI from some guy walking up on me with their PI machine. I wanted the antipode of my every day. So I strapped on my pack and started walking to point "A," my breath streaming over my shoulder in puffs like a steam engine. In mere minutes I was alone and the sun was beginning its ascent, bathing the hills in light that looked like something out of a dream or perhaps a memory, its edges worn smooth by time. Maybe the soldiers who fought here as young men while reflecting in later years on those days remembered the hills of Beauregard looking like this. I reached the spot where, at the last Beuaregard DIV, I'd recovered dozens of relics including massive .69 caliber minies. There was no one, I mean no one, in sight. I was completely and utterly alone with Beauregard and the echoes of the men who had camped in this place in 1863. I turned on the GPX 4800 --it seemed almost too good to be true--and I started slowly walking down the gradual slope toward Flat Run and over what I knew to be the center of the camp. I think it might have been 5 seconds. Maybe 10 at most. But almost instantaneously I heard the unmistakable sound in my Grey Ghosts of a bullet. 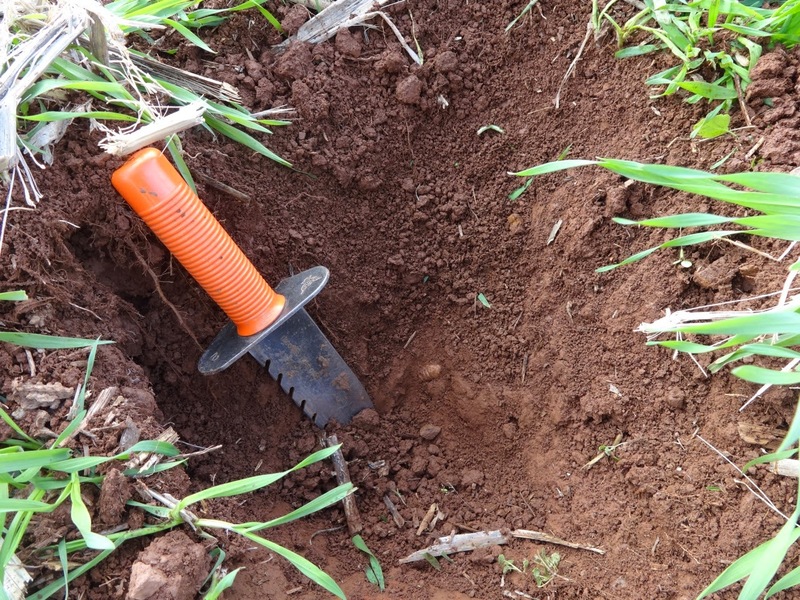 I pushed the blade of my shovel into the soil which was covered by a close-cropped growth of rye, dug a mid-sized hole, and out popped a .69 caliber round ball. I looked at it laying there and, instead of grabbing it, I tried to take it in. A flock of at least 100 geese was flying over my head and I had the most intense sensation of The Past I think I have ever felt. My decision to come to this place had been the right one. 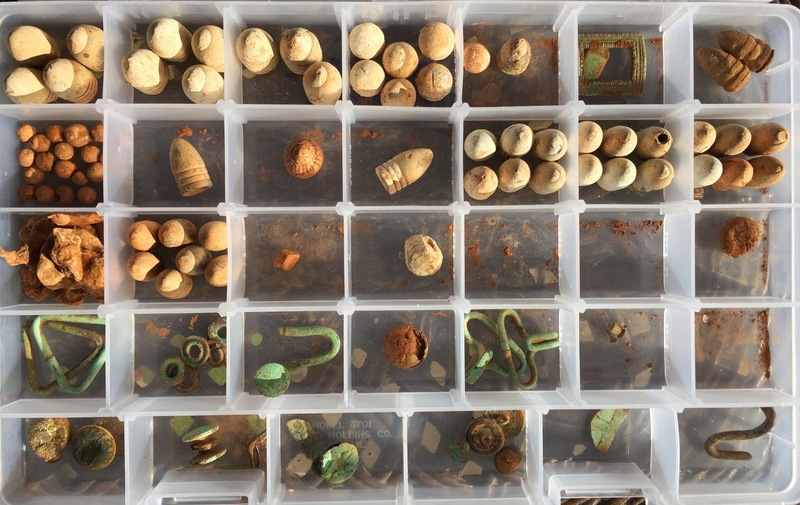 No, I hadn't found a Kearny Cross or a plate, but as Howard Crouch wrote, quoting Steve Henry, a past president of the Northern Virginia Relic Hunters Association, "I don't collect relics, I collect history." For the next three hours or so, I had the entire hillside to myself. 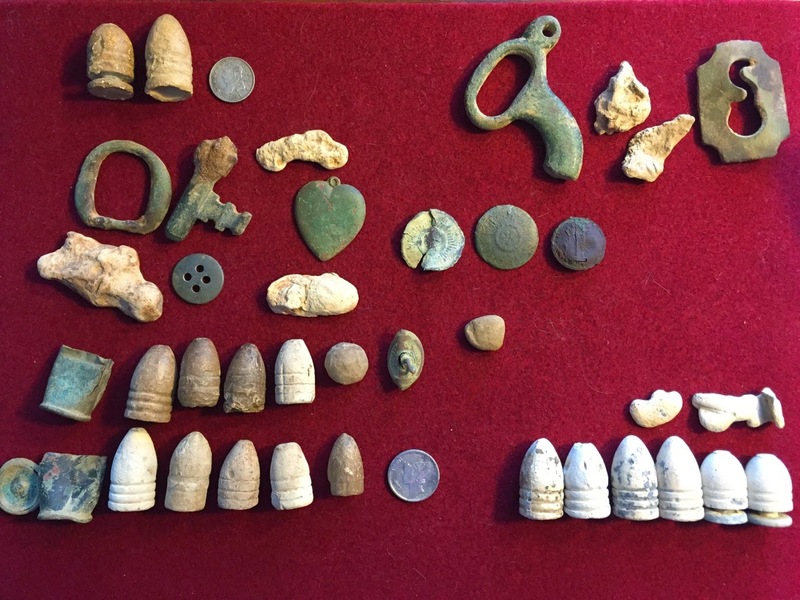 I ended up digging exactly one dozen .69 minies, an unidentified brass buckle, 19 .30 caliber buckshot (from buck and ball loads), several rivets, a J-hook, and various other pieces of knapsack hardware. 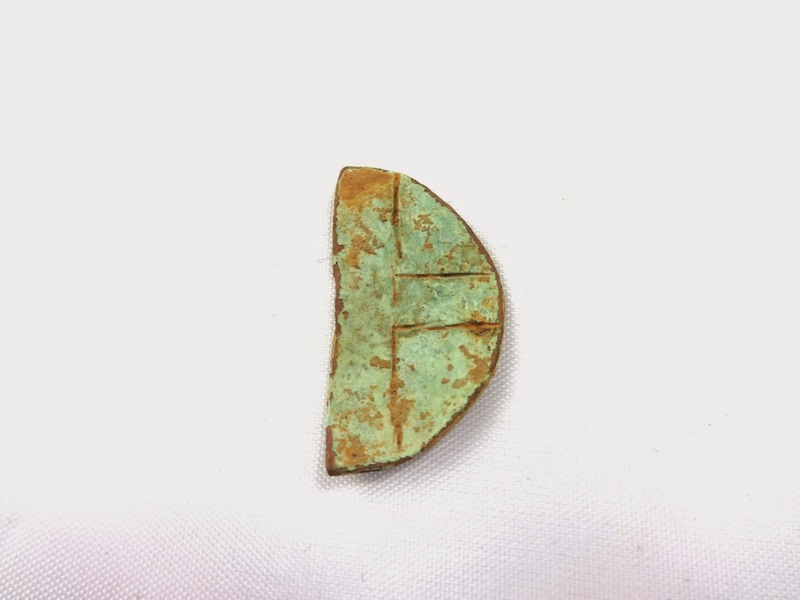 One other relic is a bit of a mystery but it looks to me like a soldier may have been trying to fabricate a Sixth Corps badge. Here's a picture of the disk with the shape of a cross stamped into it. Hard to say, but Beauregard was part of the extended winter camp for the US 6th AC. Eventually, I learned a lesson. If you whip out a camera and start taking pictures of whatever's lying in the bottom of your hole at DIV, it's the equivalent of blood in water to a shark. I was in the middle of taking some photos of bullets in situ for the blog and so I could re-live their discovery, when I happened to look up. By this time, around noon, I'd been digging in my spot for about five, blissful, uninterrupted hours. But eventually, folks began to show up on the surrounding hills. 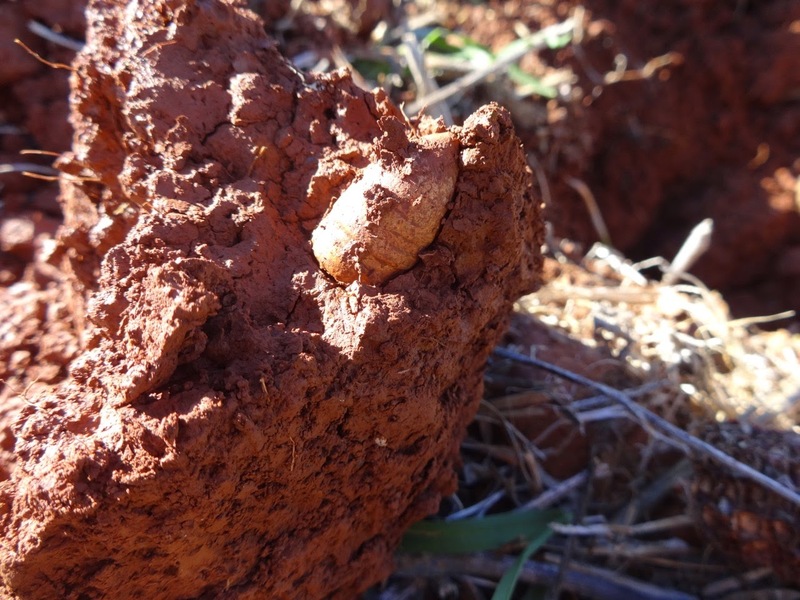 Whenever I'd start to dig, I would see them peering intently in my direction to see if I was finding anything. 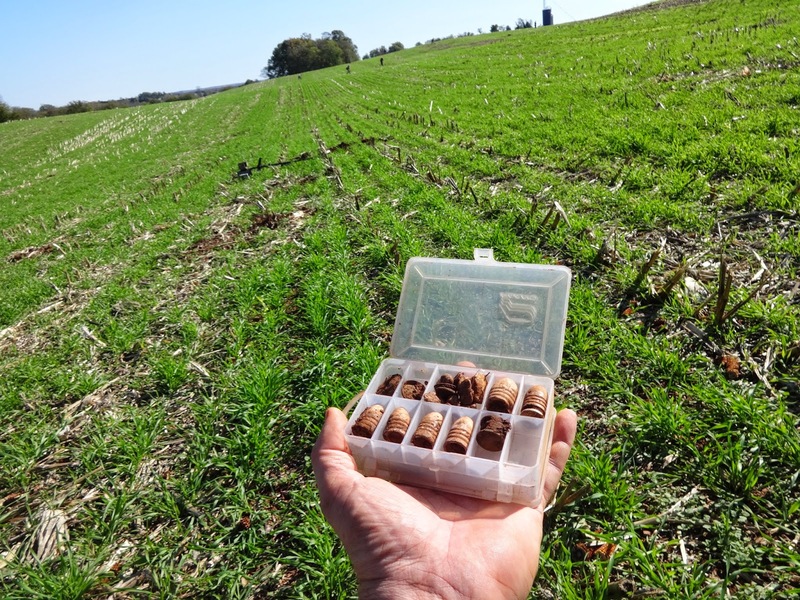 If I put something in my finds box, it resulted in at least a 25 yard closer trans-location of the encroaching hunters on my position. As I repeatedly recovered bullets and what not, the pack closed on my position and by now was maintaining a still respectful 50 yard distance. But the camera broke the camel's back. 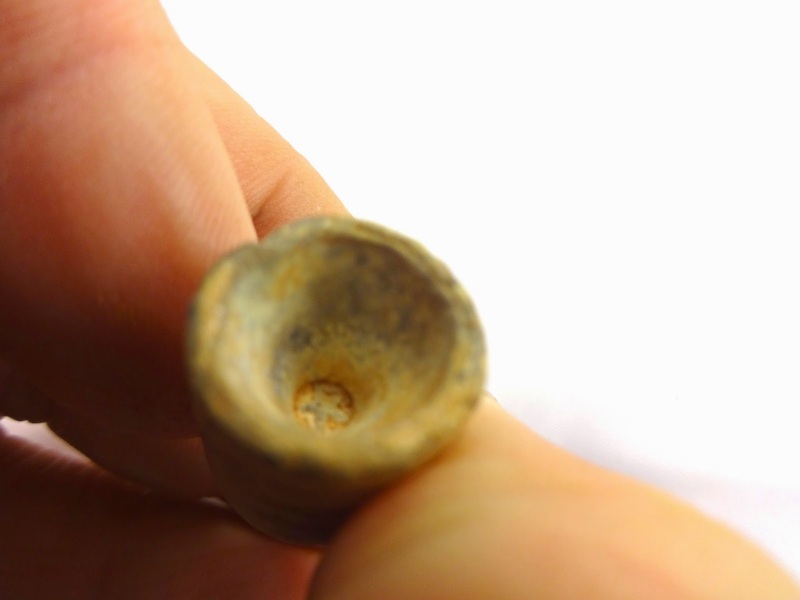 When I started taking pictures of the mysterious treasures in my hole, it was like a lunch whistle blew on a construction site. The entire pack of detectors simultaneously turned in my direction and started sweeping and marching rapidly in my direction. They closed to about 15 yards, saw my concentrated dig holes, and started swinging over them. My serenity, alas, was gone. That was okay, there was more to find at Beauregard and anyway most of these folks were swinging VLF machines. I wished them good luck, showed them a few of my finds, collected my pack, and moved on to point "B" on my hunt plan. 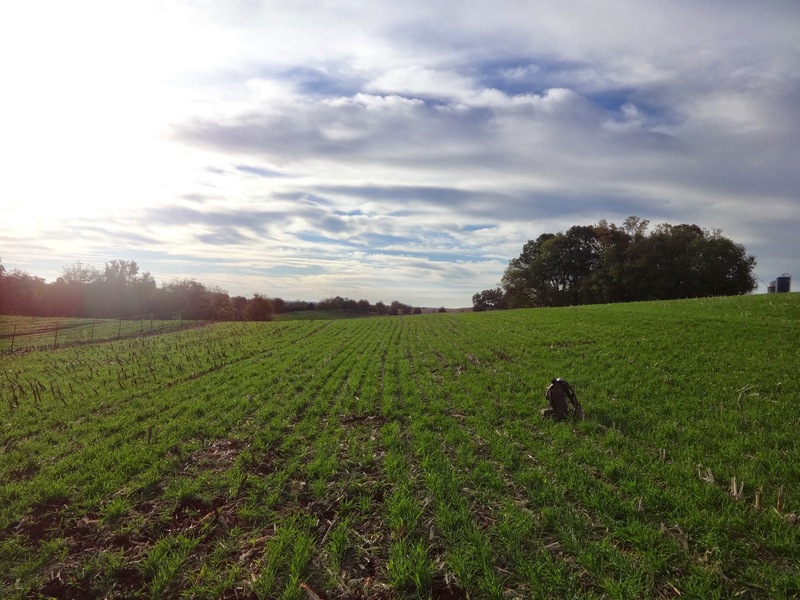 This location had yielded some nice CS bullets and buttons in previous hunts and abutted the Spillman farm. But a thick layer of corn husks on the ground made hunting here quite difficult. I spent a couple of hours and found little more than a big chunk of melted lead. But I closed out the day with a satisfyingly full pouch of relics. I started out the second day in a location that hadn't been part of my plan and ended up repeating the experience from the day before with little to show for miles of walking and hours of swinging. A bird in the hand is worth two in the bush. I learned that important lesson for the hundredth time that day-- if a location is producing, hunt it hard instead of wandering in search of the grail. So I returned to my original spot, now with considerably more dig holes not of my making, and hunkered down to see what else could be slumbering in the sacred soil. It was another stunningly beautiful, short sleeves day. I began detecting in the same vicinity as I'd been the previous morning and the finds kept coming even though there was quite a crowd there now. My first relic was yet another .69 minie but this one had been carved. Eventually, I moved out of the concentrated ".69 camp" (I think there at least 5 areas at Beauregard called that) and into a different camp where the only bullets were standard .58 "3 ringers." 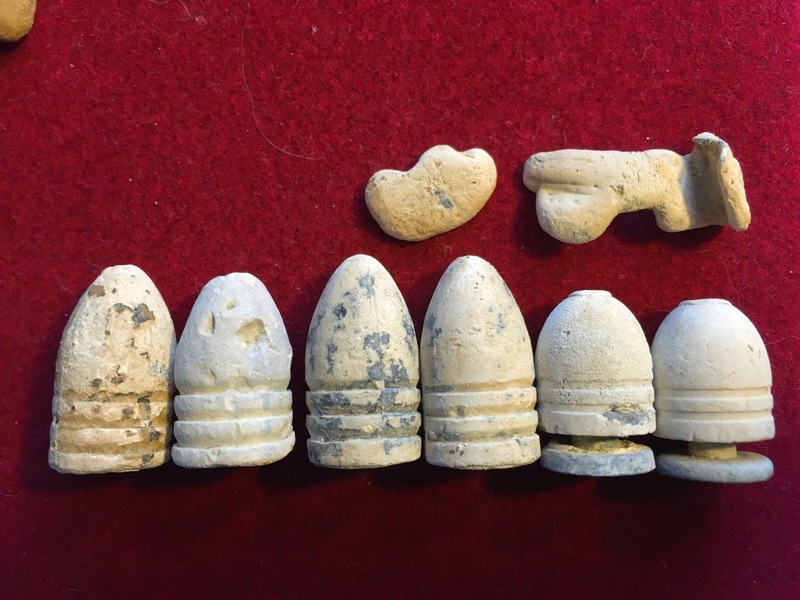 Within an hour, I had a few bullets, some more buck and ball loads, and two general service eagle buttons in my pouch. The area began to attract more and more hunters, probably folks who had been to the "new site" the day before and deemed it unproductive (something which wasn't true, incidentally). In spite of the crowd, I was still able to pull quite a few nice brass pieces out of this spot including a saber belt grommet with leather still attached, and an Eagle staff officer's button. I decided to proceed with my original plan and headed to my third point of interest. This was an area near where several Shaler sectional bullets had been found at previous DIVs. Quite a few folks had been there the first day and my goal wasn't Shalers so much as Gardners. It was a bit of a hike from where I was dropped off but after an exhilarating walk on a beautiful day I turned the 4800 on and, about 10 yards from the road, dug a nice dropped 3 ringer followed by an Eagle button and a Type 2 Williams bullet. By the time I'd hunted my way to the hillside that was my preferred location, I noticed another person was already there. From his technique it was obvious that he was an experienced detector and his densely clustered dig holes attested to his success in the area. We each maintained a respectful distance from each other, allowing us to hear the elusive deep signals otherwise drowned out by EMI. He continued to search the hillside while I detected the hill crest. Eventually, I got a piercingly loud brass signal. I dug, dug some more, then more, then even more. 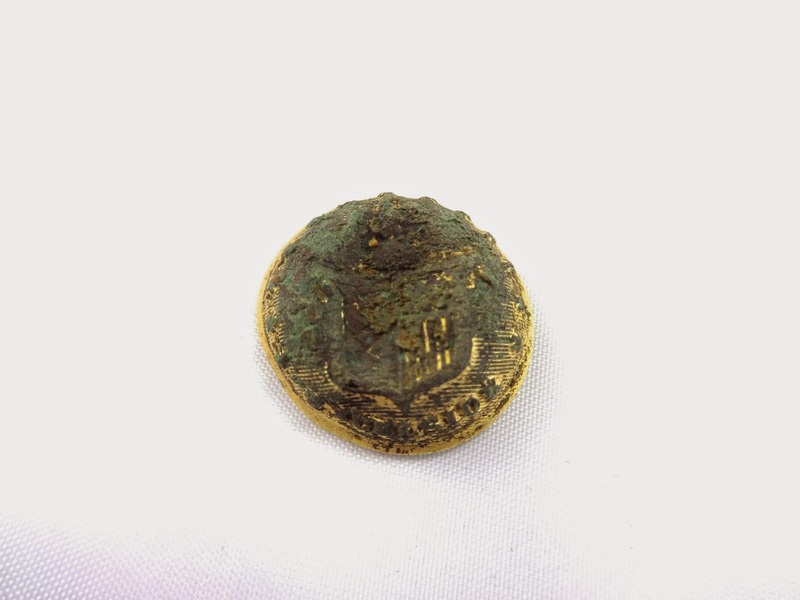 Finally, I found the target -- a New York button, lacking the back but with quite a lot of gilt still left. It was right on the top of that hill, about 15" or so deep. It sounded like it had been 2" deep! I was taking some pictures when the other fellow came over, introduced himself, and we compared finds. Sure enough, he'd been digging Gardner bullets whereas I, a mere thirty yards away, was finding only Yankee stuff. Eventually, it dawned on me that I was not just thirsty but genuinely dehydrated. I'd packed a lot of water but had already gone through it all. The amount of deep holes I was digging combined with the warm weather had parched me pretty thoroughly. So I started the long hike back to the DIV HQ at the Barbour House to get some lunch and libation. As it turned out, I was at probably the farthest point on the map from the HQ and it took me a long time, even at my customary brisk walk, to get there. Shortly before I arrived, the pickups parked around HQ all started driving away en masse. This didn't bode well —it meant that lunch was over and folks were headed back out to get in the last hours of digging for this DIV. Finally, I got there only to discover that the hot dogs were gone. I can't describe to you the profound sadness this caused me. But one of the committee members, I failed to get her name but she reminded me of many of my wonderful, doting female relatives who cared for me while growing up in the South, noticed my predicament. She brought me several cans of Sprite and it was like nectar —never had a soda tasted so good. Then she gave me several slices of pound cake and I sat down right there in the middle of the now empty parking lot without even bothering to take my pack off, and ate every last morsel of that heavenly cake. Thank you to my benefactress! I was now fully restored and ready to get back to relic hunting. But where to go? 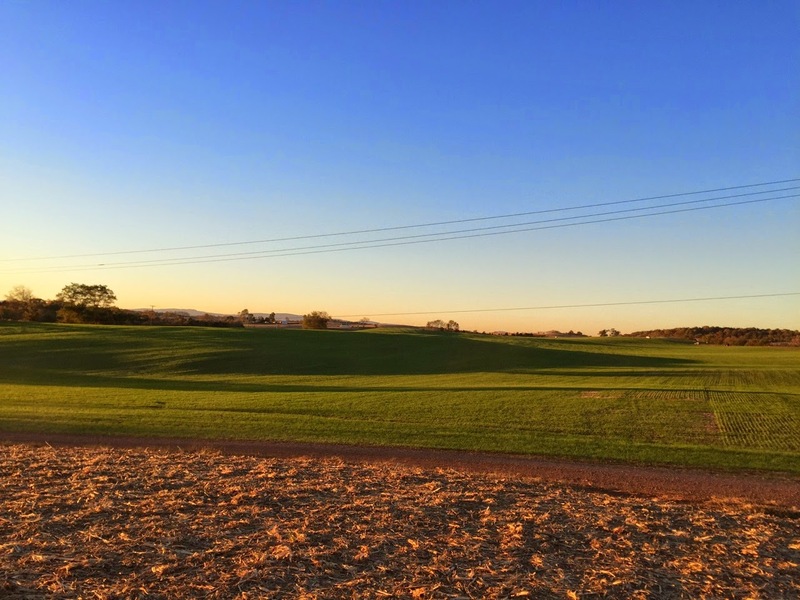 I decided the field at hand was hard to beat so I strode out into a setting that looked more like a golf course than a hay and dairy farm much less a Civil War encampment, to see what I could find. Before long, I got a round ball. 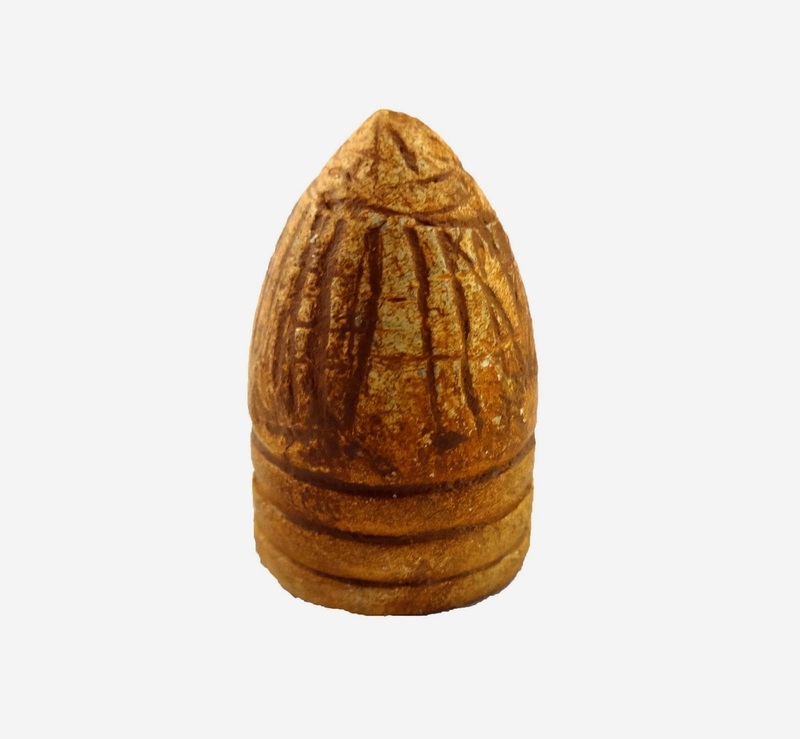 Then a carved bullet. And then, a very faint signal. There's no doubt that this was my deepest relic ever. I started hunting slowly and ... yes, another whisper. Again, another bullet, this time a Sharps. 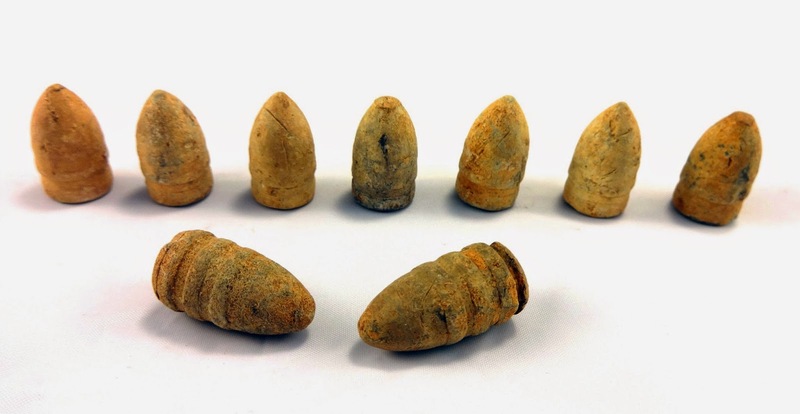 I hunkered down and started finding more Sharps bullets including two, incredibly deep Ringtail Sharps. They came out of the ground more lead-colored grey than white. 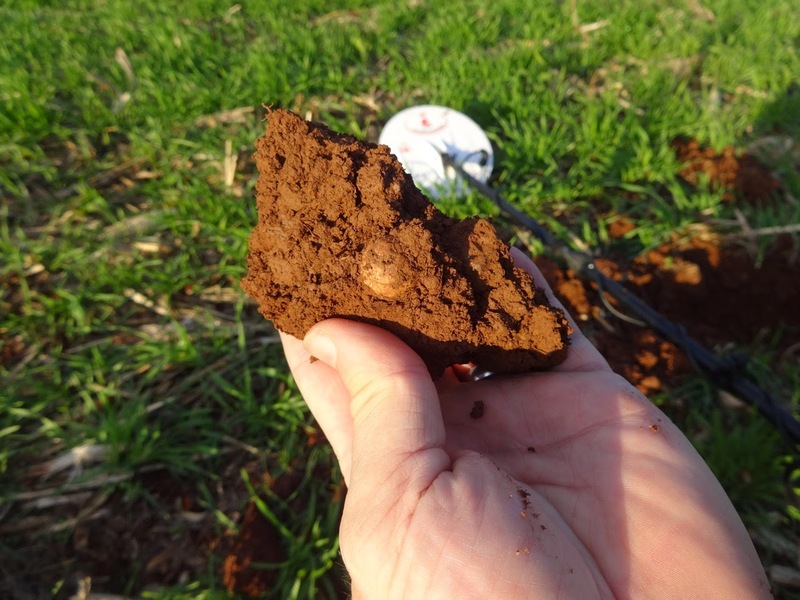 I think the depth and the clay helped prevent the typical oxidation that bullets in soil undergo. This turned out to be an excellent spot. 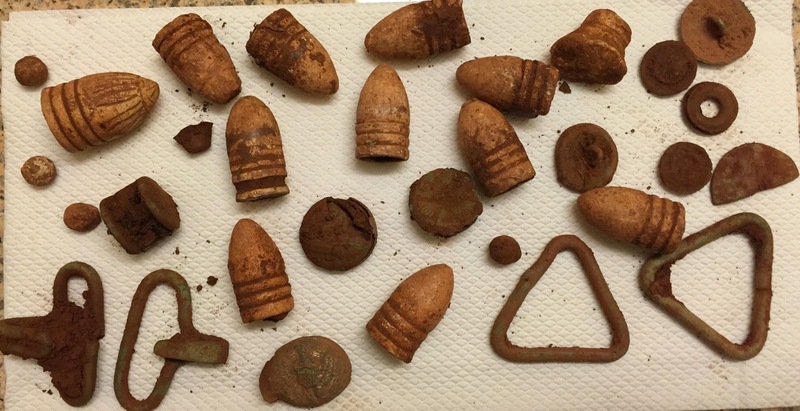 I went on to find many more bullets including a Washington arsenal .58 "3 ringer" and a brass ring with a small precious stone in it. This being the last few hours of DIV XXVIII, I wanted to capture some of the images for perpetuity and of course it was like ringing a dinner bell and one guy was so "hungry" he came right on over to within 20 feet of me and just about blew my ears off with quavering EMI. It was okay. 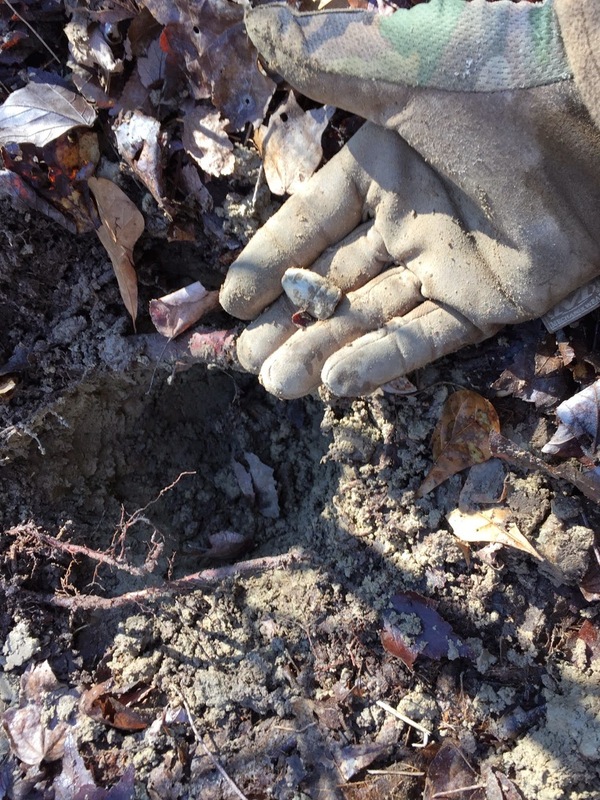 I was at Beauregard, at DIV, digging relics that had been in the ground since 1863. The sun was shining and I had just enough enough Sprite and cake to feed an army. 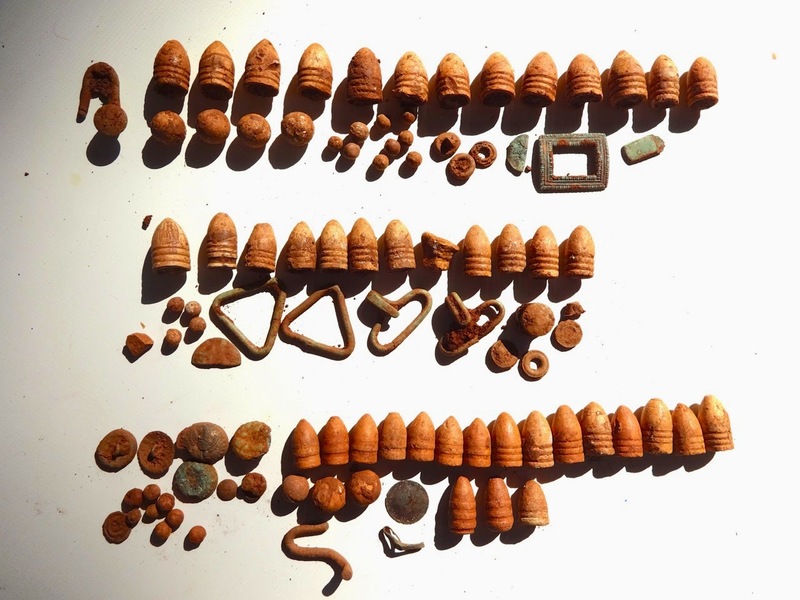 Finds arranged by Day. From top down: 1, 2, and 3. DIV XXVIII was undoubtedly my favorite DIV. From start to finish in its entirety it was dream-like. Yes, I found a lot of relics and I was happy with that. 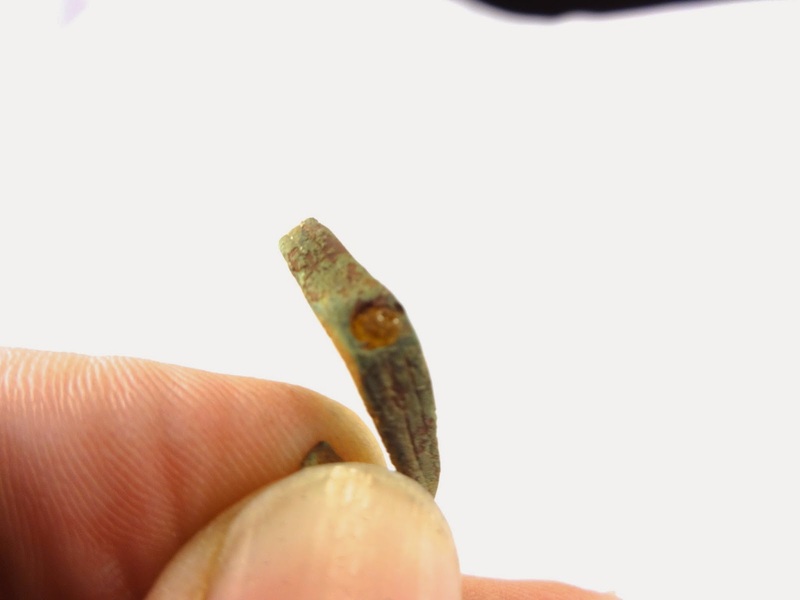 I think that my detecting abilities have dramatically improved and I'm now consistently digging relics that previously I would have missed. That's a great feeling. But the best part of this DIV for me was the extraordinarily rare privilege to really experience a connection with the past. That's what drives relic hunting for me, it's why I spend umpteen hours and $ and brave poison ivy, ticks, electric fences, you-name-it, on this pursuit. There is just nothing like the mystical experience of standing outside of time, if only for a few seconds, and seeing life as it was in the 1860s for these men caught up in the immense, tragic struggle of the American Civil War. I can't think John and Rose Kendrick enough for the incredible opportunity to attend DIV and for their stewardship of these historical sites. I'm grateful for the friendships, camaraderie and "war stories" shared with other DIV'ers and hopefully I'll get to experience more of that, not to mention Sprite, cake, and relics.